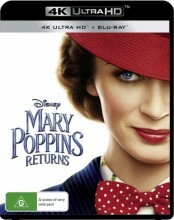 Mary Poppins Returns 4K UHD Blu Ray from DVDLand. Now an adult with three children, bank teller Michael Banks learns that his house will be repossessed in five days unless he can pay back a loan. His only hope is to find a missing certificate that shows proof of valuable shares that his father left him years earlier. Just as all seems lost, Michael and his sister receive the surprise of a lifetime when Mary Poppins--the beloved nanny from their childhood--arrives to save the day and take the Banks family on a magical, fun-filled adventure. Click the button below to add the Mary Poppins Returns (4K UHD Blu Ray) to your wish list.